As you probably already know, DJ Format & Abdominal are hitting the UK roads once again to spread the glorious word of their current LP, STILL HUNGRY. Released in April of this year, the duo had success through the Spring with another sell out tour, a #1 album chart topping position on Bandcamp (for two months! ), play listing and appearances on BBC 6 Music and Soho Radio and ample rave reviews. 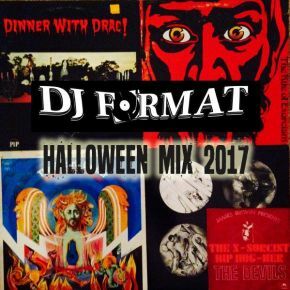 Still Hungry Tour Pt.II kicks off on the long Halloween weekend and to celebrate, DJ Format has crafted on an point mix to celebrate all things that go bump in the night! Expect horror, monsters, nightmares, terror and devil's in disguise when you click the link for a 50 minute ride into the darkness of dooooooom! !